Seale Financial Learning Center in the Gatton College of Business and Economics. Photo provided by Gatton College. 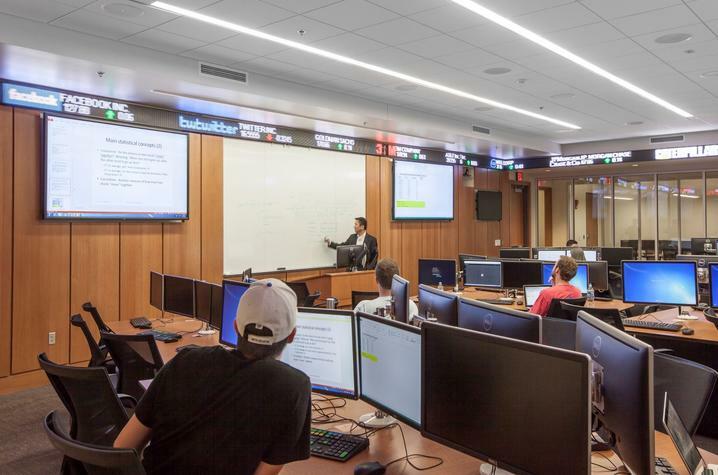 LEXINGTON, Ky. (Feb. 12, 2019) — The University of Kentucky Gatton College of Business and Economics announces the second UK Stock Pitch competition taking place through this spring. This event provides an opportunity for students to carry out creative, value-added research in stock investing and to obtain real-world insights about business. It also offers close to $4,000 in cash prizes. Sponsored by the Department of Finance and Quantitative Methods, the competition is open to all University of Kentucky students enrolled full time in undergraduate or master’s programs as of Jan. 18, 2019. Michael Rudzik (managing director, PAAMCO Prisma). An information session showing how to explore data and templates on Bloomberg and Capita IQ will be held from 6 to 7 p.m. Wednesday, Feb. 13, in the Seale Financial Learning Center, Room 260 in the Gatton College Building. Team formations (two to four students each team) and mentoring requests must be submitted online between now and Feb. 17. The final competition will be held April 11, 2019. Details regarding team formation, prizes, presentation rules and judging criteria can be found at: http://gatton.uky.edu/uk-stock-pitch-competition-2019.